Sky Map: The view as of 10:30 p.m. local time on May 27 from mid-northern latitudes. 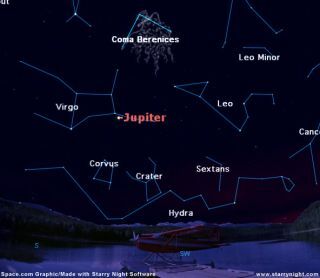 High in the sky and passing almost directly overhead as darkness falls now is the constellation that owes its name to a theft: Coma Berenices or Berenice's Hair. With the bright Moon now out of our evening sky, this week is fine time to look for it. This pattern of stars is actually a fine star cluster that appears as a faint shimmering patch of light on clear moonless nights, best viewed with a good pair of binoculars. Berenice was an Egyptian Queen, the wife of Ptolemy Euergetes who reigned around 250 B.C. The story goes that she sacrificed her beautiful amber tresses and placed them in the Temple of Venus at Zephyrium as she had vowed to do if her husband returned victorious from his war against Babylon. The hair was stolen from the temple but the astronomer Conon eventually convinced the disconsolate queen that Zeus himself had taken the locks and put them up into the sky. Such is the story of how the cluster got its name, though this region of the sky was not generally recognized as a separate constellation until the beginning of the 17th Century. Credit is usually given to the astronomer Tycho Brahe for first cataloguing it officially with the honorific name of Coma Berenices in the year 1602. When I point this pattern of stars out to planetarium audiences or at star parties, I simply call it, "the Wig." Initially, in fact, many of the star atlases of that era did not depict this star cluster as a celestial hairpiece. Indeed, in various star maps of the late Middle Ages the cluster was identified as a rose-wreath or ivy-wreath, and occasionally as a Sheaf of Wheat held in the hands of the nearby constellation Virgo. Others saw it as the hair of Sampson, not Berenice, while still others regarded it as a tuft at the end of the tail of Leo, the Lion. Just to the east of this cluster is the north galactic pole, one of two points in the sky lying farthest from the ghostly circle of light that composes the Milky Way. Even those who are far from light polluted skies will have great difficulty in seeing the Milky Way in our current evening sky. The reason is that it now appears to run completely around the horizon. Normally appearing as a faint, irregular ribbon of light spanning the sky, it can usually be seen at most times of the year provided the night is very clear and moonless, though never in brilliantly-lit big cities (like New York). But now, during the evening hours, even with perfect visibility the Milky Way is all but invisible as it runs along the horizon and is hidden by the denser atmosphere near the ground. So when Berenice's Hair rides high, the Milky Way runs low. Conversely, when the cluster is rising or setting, the Milky Way appears to arch nearly overhead. At this time of year, you'll have to arise just before sunrise to get such a view.